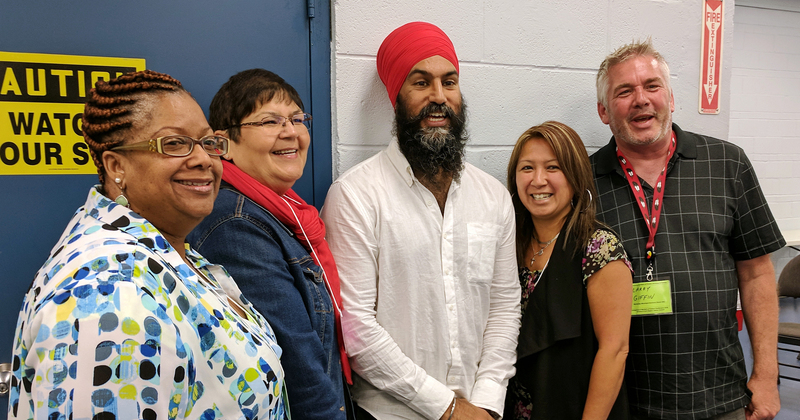 A CUPE delegation joined over 200 trade unionists at the Toronto and York Region Labour Council’s recent Indigenous and Workers of Colour Conference. The CUPE delegation included Dawn Bellerose, member of the National Aboriginal Council; Larry Giffin, Co-chair of the National Aboriginal Council; Sharon Stanley, member of the National Rainbow Committee; and Rebecca Jageshar, member of the Ontario Racial Justice Committee. The conference was so well attended that organizers celebrated the need to move to a larger facility for next year’s event. The conference hosted keynotes from Jagmeet Singh, Leader of the New Democratic Party of Canada and Matthew Green, the City of Hamilton’s first Municipal Councillor of African descent. The one-day conference on June 16 featured workshops that were all well attended and hosted robust discussions on election organizing, building allyship, Indigenous realities and systemic racism. The conference’s featured panel was titled, “#MeToo – An Indigenous and racialized perspective.” Panelists shared their experiences and challenges battling sexual harassment against Indigenous and racialized women in Canada. Panelist Maggie Cywink encouraged attendees to work with their locals to support one of the 298 Indigenous families across Ontario who have lost a daughter, sister or aunt to violence. CUPE continues to mobilize for action against discrimination, poverty and injustice and celebrates members who advance our vision for a better country.